Well, the siege at the Malheur National Wildlife Refuge in Oregon is winding down, with the ringleader and 10 of his followers under arrest, and four hold-outs still rattling their sabres (AR-15s and the like) at the refuge over the alleged tyranny of the U.S. government. For those of you unfamiliar with this story, Ammon Bundy and about 20 very-well armed associates took over the wildlife refuge on Jan. 2, ostensibly in protest of a federal prison sentence handed down to Oregon ranchers Dwight and Steven Hammond for arson on public lands that the ranchers grazed their cattle on. Upon the Bundy seizure of the refuge, the Hammonds quickly disassociated themselves from Bundy, proclaimed that the Bundy gang did not speak for them, and urged Bundy and his gang to leave the refuge. Bundy just as quickly quit referring to the Hammonds’ plight as the excuse for the armed take-over. The new excuse posited the seizure as a protest against the Federal Government’s unconstitutional ownership and management of federal lands, and Bundy’s militia vowed not to give up the refuge until the government turned it over to the people of Harney County. Well, the government—federal and state—kept its distance from the refuge and the siege has thus far lasted some 28 days at what is excepted to be great taxpayer expense, not to mention great inconvenience to the residents of Harney County, who are under a partial lockdown, with schools closed and businesses related to the popular refuge shut down. 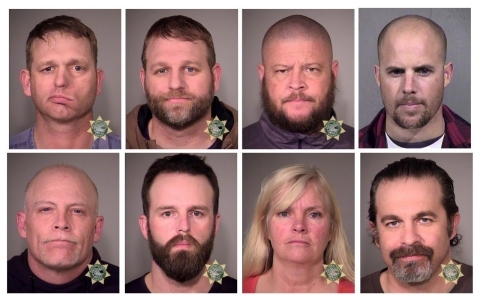 Now, we could stop right here and ask you to hash out your thoughts about whether the Bundy militia is comprised of true-blue patriots or self-righteous, right-wing Looney Tunes. But no, we’re going to go back a couple of years to another siege of sorts, which was initiated by Ammon Bundy’s father and has yet to be resolved. You see, in April 2014, a self-proclaimed militia came to the defence of Ammon’s father Cliven Bundy, whose cattle were being impounded in the Gold Butte area of Clark County, Nevada by the Federal Bureau of Land Management. The impoundment was ordered due to Cliven’s failure to pay more than $1 million in grazing fees and fines for non-payment and non-compliance with grazing regulations over the course of two decades. For the record federal grazing fees are relatively cheap and represent a 93 percent discount from what the private sector charges. However, Cliven in 1993 declared, among other things, that any federal ownership or control of the land was null and void, and spent the next 20 years all but ignoring federal efforts to collect any payment due or force compliance with grazing regulations. Cliven did attend the many federal court proceedings against him, all of which ended up in favor of the government and ordering Cliven to pay the ever-increasing fees and fines and comply with grazing regulations. And finally, on April 5, the government took direct action by starting the round up and removal of the trespassing Bundy livestock that had freely grazed with impunity for so long. Armed militia members and other antigovernment protestors showed up at Gold Butte shortly thereafter and demanded the release of the Bundy cattle. More federal agents were called to the scene and an armed stand-off of sorts ensued. After several days of escalating tensions the government backed down, released the Bundy cattle and withdrew. Cliven quickly followed up his success by demanding the country sheriff disarm the National Park Service at Lake Meade and Red Rock Park, and then declared that county sheriffs across the country should “disarm the federal bureaucrats.” Cliven became a darling to the Tea Party, the extreme-right wing of the Republican party and prominent members of the right-wing press. This quickly faded within a week after Bundy, wise sage that he is, publicly stated that African-Americans might be better off as “slaves, picking cotton and having a family life,” rather than living off government subsidies. So, Hash It Out! Is Cliven Bundy a scofflaw or a defender of the people’s rights and ownership of the land? Are the Bundy militia members patriots or domestic terrorists? And, should the government continue to let these “patriots” of whatever stripe take over federal land without repercussion, or arrest them for their various transgressions? —Published in hashitout.com Jan. 29, 2015.